School’s out and busy, buzzy classrooms stand silent. 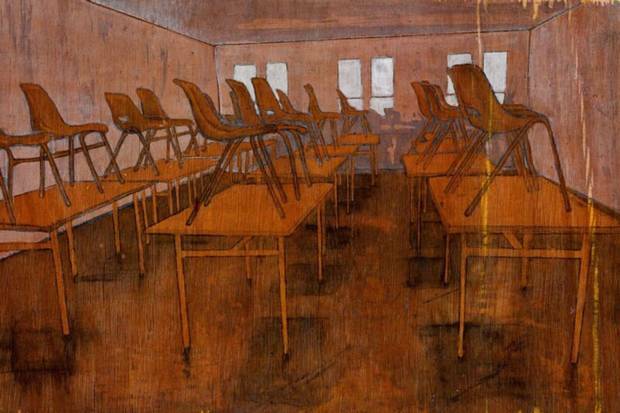 Artist Kirsti Kotilainen has just completed her first year teaching in Tallaght and this artwork captures the space where she worked with her 20 students. “The Irish curriculum is better.” In Finland art is not examined, it is seen as a hobby, but she still admires the Finnish system. Her background is working-class and yet “there was no question that I wouldn’t go to college. Finland’s a social democracy… I grew up in a block of flats next to a middle-class area. We all went to the same school, we all played together”. Tallaght is a different world, “a world I like to connect with”. In her art room with its “white walls and grey lino” Kotilainen says “you don’t just pour information in. Every student is different, some have baggage, In Tallaght you see the world. They draw horses, fast cars, nature. They love seeing their clay pieces come from the kiln”. Kotilainen grew up in Loviisa, a coastal town east of Helsinki, and all she had heard about Ireland, before she spent a Gap Year in ceasefire Belfast, were the Troubles and the X Case. Returning later, she worked as a legal executive then signed up for NCAD.